Once we settled into the hotel, we decided to go exploring DCFD firehouses via taxi cab. The crew at the first house we visited were nice enough but not exactly engaging with visiting firefighters, so we hailed another cab. Our new cab driver randomly dropped us at a firehouse located near the corner of 13th and L streets. We were promptly greeted by the firefighter sitting on the bench, his feet resting comfortably on the firefighter-tailored foot rest. Following brief introductions, we were invited inside. From their Facebook page: The Midnight Express is first due to “The White House” and much of downtown D.C. to the South and West side of our first due, with a large area of residential high rises and row houses on the Northern and Eastern side of their first due. Their house on 13th St. quarters Battalion Chief 6, Engine Company 16, Tower Ladder 3, Firefighter Ambulance 16, EMS Captain 6, Water Supply Engine 56, Ready Reserve Engine 76 and “Old Face”. They’ve been living together as brothers in the “New Quarters” at 1018 13th St. since 1932.With me in the photo is one of the truckies, aptly named “Iron Mike” Rodgers. I’ll never forget how he grabbed a 10 lb. sledge at the bottom of the handle and touched it to his nose just by flinching his wrist. I told him he could probably do the same thing by holding me up by my ankle. 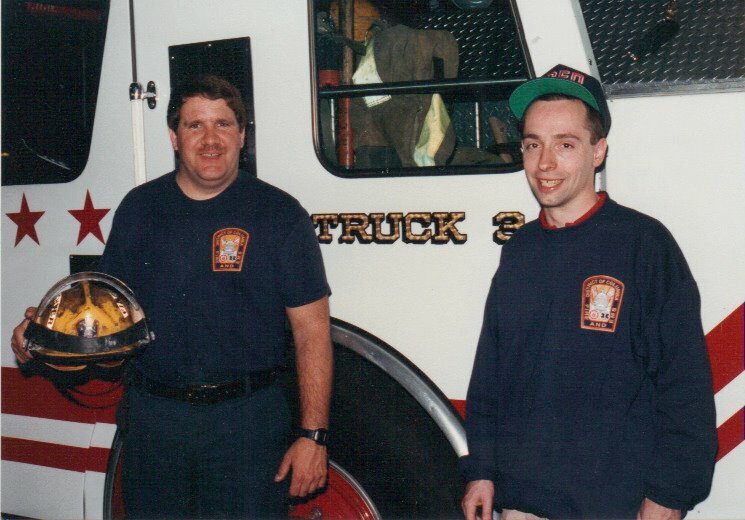 He said, “I bet I can too!” lolI still have that same sweatshirt and hat more than 20 years later, compliments of Elliot Goodman and I think of my time spent with the DCFD and those three friends every time I wear it. Good times, good friends and great memories were made as we revisited together every year for 4 years straight. More stories to follow.